“The Strangers: Prey at Night” is a sweet and short experience of tension, thrills and jumpscares. At only an hour and twenty five minutes, this movie doesn’t drag on too long or get boring to watch. It’s decently paced, beautifully shot and gives the world an actual good horror sequel. Even if it is 10 years after the original. Similar to the 2008 “The Strangers,” the movie starts off with the characters already going through drama. The viewers are kind of thrust into the middle of the situation. This is where the strong writing really shows, as no one said outright what’s going on. It’s realistic, unlike some movies that will have characters spout out information for no reason than to explain the plot to the audience. The teenage daughter Kinsey, played by Bailee Madison, is being sent to boarding school for behavioral issues. Just from the way the characters act and talk to each other, it shows that she’s been acting out for a while and she finally pushed things too far. Her brother Luke, played by Lewis Pullman, resents her and said she acts out for attention. Mike and Cindy, her parents, aren’t happy about sending their daughter away and constantly second guess themselves when they’re alone. The day before Kinsey officially moves into boarding school, the family spends the night in a trailer owned by an uncle. It’s never mentioned why, best guess is it’s closer to the school and they have to move all her stuff the day after. When they get there, a mysterious stranger with long blonde hair knocks on the door and asks for someone named Tamara, an exact repeat of the original “The Strangers” setup. The scene is perfect. The audience can barely make out the young woman’s face, but can’t make out any features. Once they tell her that she has the wrong place, she wordlessly walks off. Kinsey eventually storms off and the parents send Luke to go after her and bring her back. While they’re gone, the parents talk over whether or not sending Kinsey away is the right choice. Kinsey and Luke have a nice bonding moment as siblings. They insult each other and can be downright mean, but they still have a certain understanding between them. This scene makes it clear that they still care about one another, just like real siblings. The young woman, called Dollface, comes back and asks the same question while the kids are gone. Mike answers, and she walks off without saying anything else again. Cindy gets worried and they go out looking for their kids, because that creep is suspiciously hanging around their trailer and no one else seems to be around. Kinsey and Luke come accross a trailer with the door open. They naturally go inside and find the rotting corpses of their aunt and uncle. They freak out and run off screaming, finding their parents quickly. They explain what they saw, and Luke takes his father back to see the bodies, while Cindy and Kinsey go back in the trailer to call the police. They find that all of their phones have been broken and they are not alone in the trailer. From this point on, it’s pretty much the same story as the original. They just have more people and a bigger space to work with. It’s the exact same people-are-home-alone- masked-killers-show-up-and-hunt-them-down movie. The protagonists here fight back way better than the leads of the original. 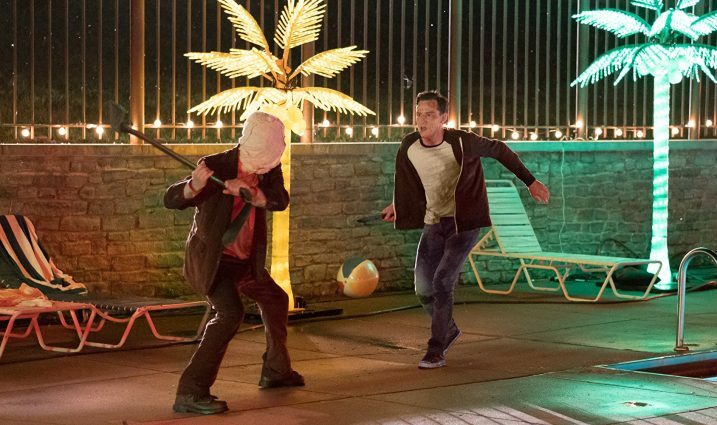 There is nothing more satisfying than seeing a serial killer getting hit upside the head with a golf club. Especially after seeing how terrible every other horror movie’s main characters are at self defense. The protagonists’ ability to defend themselves mildly well. This would be a pretty standard horror movie full of jumpscares and cheap thrills if it wasn’t for the cinematography and soundtrack. The camera is often at a vantage point or trailing shakily behind someone. It makes it feel like looking through the eyes of a deranged serial killer stalking their victims. It adds a nice touch to the overall feel of the movie. The creepy ambient horror movie background noises to enhance suspense are used sparingly. For the most part, the music consists of songs that sound like something from a top hits of the ‘70s playlist. These songs were played over bloody murder scenes. It’s actually kind of hilarious how jarring the songs are. Audience reactions have been pretty positive. They jumped at the jumpscares. They swore and moved in their seats at the suspenseful moments. They also cheered when Kinsey shot Dollface at point blank range with a double barrel shotgun. It was like walking through a haunted house. People screamed and laughed every couple of minutes. As for the ending, it falls into the typical let’s-try-and-get-them-with-one-last-scare category. It does the same thing every other scary movie tries, which is make the character look like they got away only to be caught at the last minute, then they get away again. It would be fine, except “The Strangers: Prey at Night” does this three times in a row before the movie ends. Aside from having the same masked killers and the same based on a true story premise, “Prey at Night” has virtually no connection to the first movie. People could go see it without having ever seen the first one and could probably get the same enjoyment out of it. The worst thing to be seen is the rotting corpses of the uncle and aunt. They looked pretty fake. Overall, “The Strangers: Prey at Night” is an enjoyable hour and a half that doesn’t overstay its welcome and earns its Rated R for its language.